Opening stand with KL Rahul, Shaw put up 147, helping his side post a mammoth score. President's XI comfortably beat New Zealand by 30 runs in their opening warm-up game, in Mumbai on Tuesday. Batting first Board President's XI scored 295 for 9 in 50 overs and then bowled out the tourists for 265 in 47.4 overs. 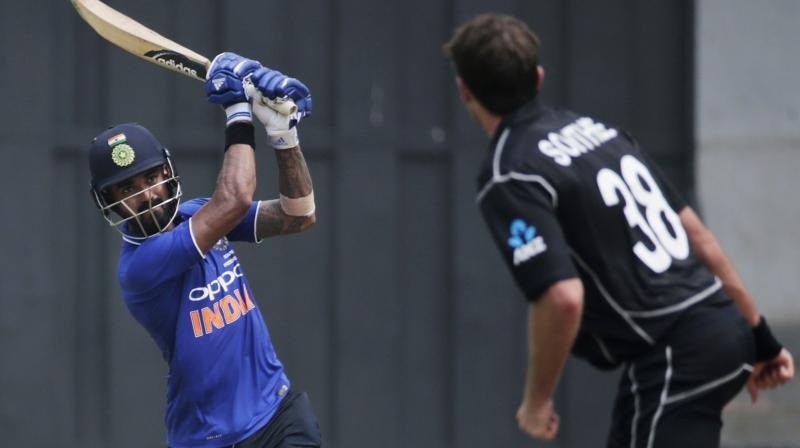 Facing a senior international side for the first time, local boy Prithvi scored 66 off 80 balls with nine boundaries and a six, putting up 147 for the opening stand with KL Rahul, who contributed 68 off 75 balls. Karun Nair also got some form going his way with 78 off 64 balls. Shahbaz Nadeem, who has had a good A series against New Zealand recently, once again had the best figures of 3/41 while defending the target. Just like their A team, the senior stars also looked clueless against the Indian tweakers. But it was Shaw, who was the cynosure of all eyes during the match. He started with a cover drive off Tim Southee. Initially, it was his senior partner Rahul, who showed more aggressive intent before the younger one took over. Very strong square off the wicket, Prithvi square cut twice and also got down the track to loft pacer Adam Milne for a six over cover and also pulled him for a boundary in the mid-wicket region. Rahul got a 'life' on 41, after he was caught deep square leg off a no-ball by Southee and then bought up his 50 off 62 balls. Rahul threw his wicket in the 26th over, after being caught by substitute Nicholls at short-fine leg off Ish Sodhi. Prithvi, who brought up his 50 in 62 balls and finally gave Henry Nicholls a catch at long off, with Mitchell Santner getting his first wicket. Karun, who struck 12 boundaries, mainly lofted drives, before being caught at wide long off by Colin Munro off Kiwi pacer Trent Boult, who ended with figures of 5/38. When the Black Caps batted, Martin Guptill hit a quickfire 20-ball-22 before being dismissed. His partner, Colin Munro (26 of 41 balls) conjured a 69- run second-wicket stand with skipper Kane Williamson (47 off 49 balls) who studded seven fours in his innings. Munro, who has a reputation of a hitter, played in completely opposite fashion while Williamson welcomed Avesh Khan, with three boundaries, a cut, a pull and a flick over mid on, as the team's 50 was brought up in the 10th over. Nearing team total of 100, Munro spooned a catch to Prithvi off Nadeem. Williamson, too, didn't last long with Karn Sharma holding on to a return catch. The visitors were left struggling at 107 for 3. Tom Latham (59 off 63 balls), who usually opens the batting, came in at number 5. He had a 73-run stand with No 4 Ross Taylor (32 off 47 balls). Both were dealing in ones and twos, with a few odd shots coming from Latham. The Kiwis needed 146 in the last 20 overs, but the big shots were missing. In the 36th over, Khan stuck removing well-settled Ross Taylor, who nicked to Pant and after that the Kiwis lost wickets at regular intervals. Latham tried to sweep Gurkeerat Mann, giving a dolly to Khan at deep-square leg. Then Nadeem joined the party as he bowled out Adam Milne (2) and Tim Southee (0) with the Kiwis tottering at 204 for 7. There wasn't much of a recovery after that. BP XI 295/9 (Prithvi Shaw 66, Karun Nair 78, KL Rahul 68). New Zealand 265 in 47.4 overs (Kane Williamson 47, Tom Latham 59, Shahbaz Nadeem 3/41).